Could you join our amazing team of volunteers? Cook (Cornerfield Cafe) – Required to cook breakfast on a Thursday morning. Cafe Assistant (Cornerfield Cafe) – We need a general helper who can serve, take money and clear tables. Food Bank Assistant – Could you learn the ropes at our food bank? We need someone who can meet and greet, fill in forms, and signpost to other organisations. 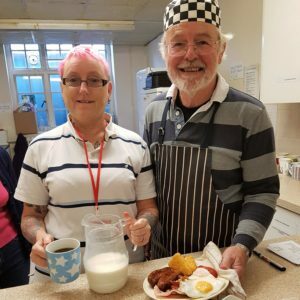 Night Shelter Volunteer URGENT! – Several volunteers are needed for regular or ad hoc overnight (sleeping) shifts and evening meet & greet shifts. Your time and effort will help those most in need in our local community. Interested? Contact Helen Allan on 01933 733001 or email info@encs.org.uk for further information.